Na was my student. She came for decoupage and scrapbooking class when I conducted them at my home about 2 years ago. Ever since then she has been doing decoupage and selling decoupage napkins and other craft products at her online store. She is running a giveaway for napkins and I feel tempted to join. Who knows if my luck is there to win 10 napkins at my own choosing. I have browsed through almost all of her napkins collection and I can’t really list down just 10..hehe! I am torn between design of roses, herbs and fruits (which God knows when I can actually use them for decoupage) But hey, I love collecting decoupage napkins even when I can’t use them straight away. So here is my list of napkins. For those who are looking to buy decoupage napkin per piece basis, feel free to visit her store or even read her blog – Raznacreation.com for ideas and tips. It’s been a while since the last class I conducted for decoupage. 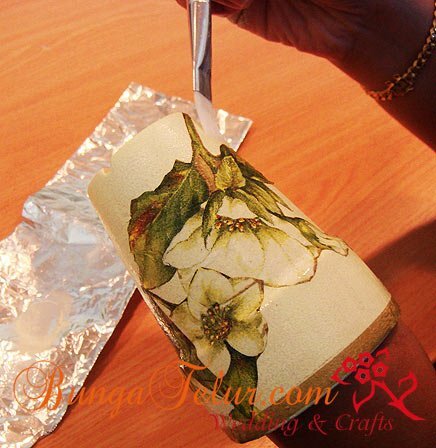 There were times when I conducted this decoupage class almost every week at home. It’s an easy craft to learn and to teach to students, especially those with less ability to be artful..haha! I am currently browsing a book titled New Decoupage: Transforming Your Home with Paper, Glue, and Scissors by Durwin Rice on Amazon. For those who are interested to know about the history of decoupage, here is some info for you to read : The Art of Decoupage. And there is even a National Guild of Decoupeurs with a membership fees of USD40 annually. For in-depth history of decoupage, read it here : A Bit Of History. 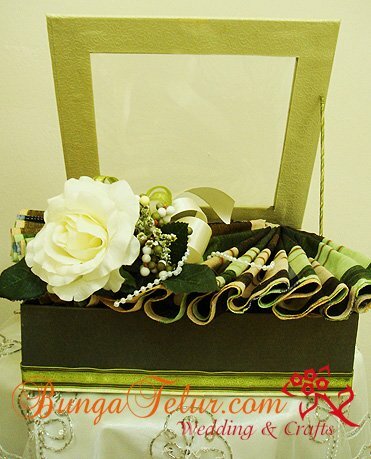 This entry is still on gubahan hantaran with green and cream color theme. It took me ages to upload all the pictures due to slow Internet connection these days. 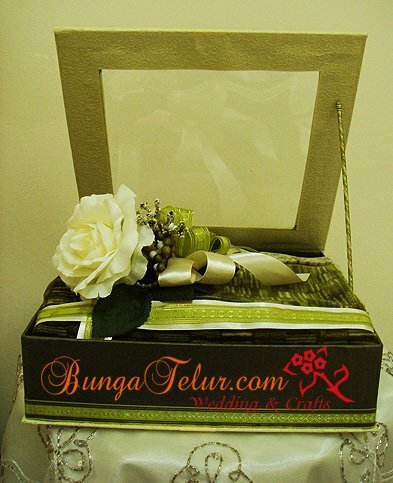 I think the idea of putting the hantaran materials in boxes are very practical as the bride and groom can always recycle the pretty boxes afterwards. I found a shop that specialized in making boxes in Puchong area and their price is very reasonable. The bride couldn’t find a miniature car to bear the ring for the groom. 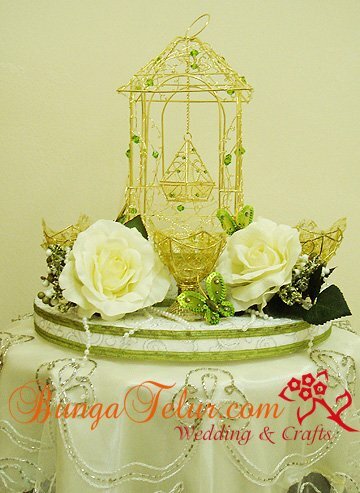 So I decided to buy this golden cage for bekas cincin as it was embellished with green decorative stones that could complement the wedding theme color. I also bought a few more golden wire cups which on the day before the wedding, I have filled up with bunga rampai made from old style daun pandan and rose petals. I have done this set of cream and green gubahan hantaran a few months back but I only managed to upload the picture of sirih junjung in the previous entry. For me, completing these cream and green gubahan was quite simple and straight forward as I already have the paper box to put in the hantaran items. Of course I have to embellish here and there to make sure that the items won’t look too bare. I put some tiny flowers and green ribbons at the top side of the chocolate boxes and arranged them nicely in the bigger box. 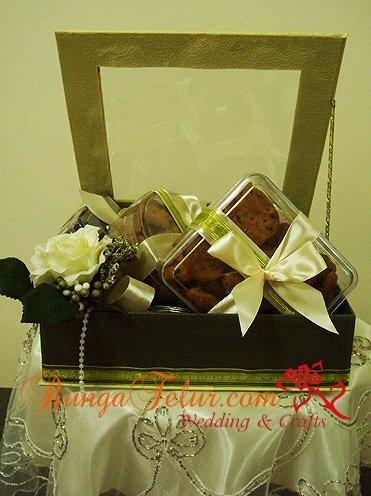 As for the cookies, the initial plan from the bride was to arrange them in their original plastic packaging from Famous Amos but when I did that, they just looked so out of place. So I found some transparent plastic packaging (which could be bought from shop that sells baking materials like Bake With Yen), rearranged the Famous Amos cookies in them nicely, tied some matching ribbons and placed them in the main box. For the watch, I didn’t touch up anything on the original box that it came in. 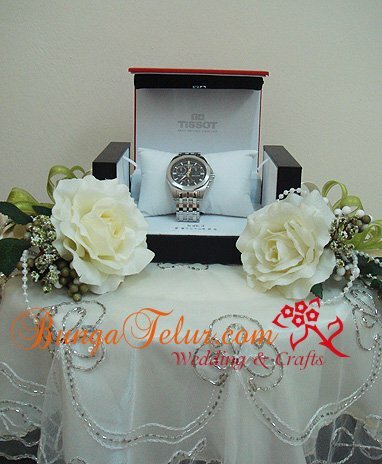 I changed the position of the bunga dulang arrangement as if to accompany the watch box on each side. I believe that for expensive items, we need not crowd them with too much decoration, a simple one will make it more outstanding and look elegant.